I'm pleased with it, for sure. I've made a few improvements since my last attempt, which is just as encouraging as ever. I used a different method for the hair, which I really think worked out well. Instead of using a base color, then drawing-on the shadows and highlights, I used the layers available in Sketchbook Express. I laid down the base color, then switched to a higher layer, and laid a darker color on top of that. I would then use the eraser tool to wipe away the dark color where appropriate, and I think it made some really nice and soft transitions. I then just used a normal tool like the airbrush to draw on the highlights. I think the face could have been more accurate. 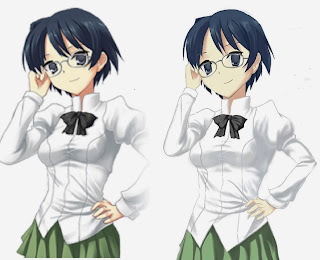 The major differences are a result of the shape of the hair, which I'd drawn first. 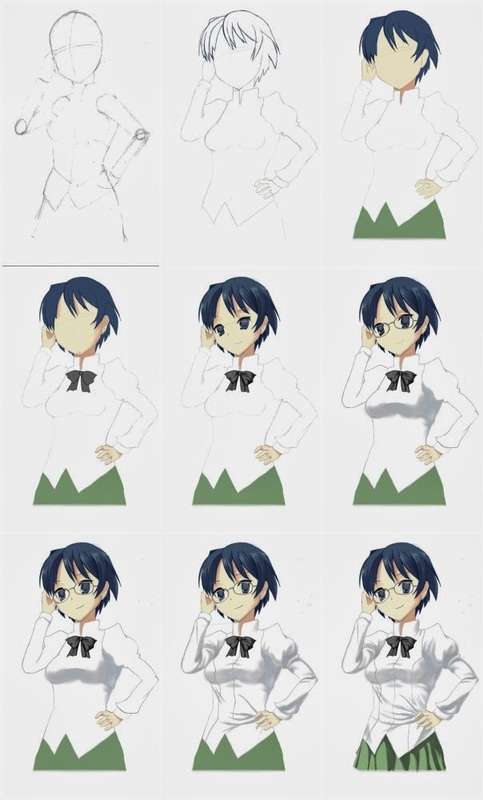 It looks like it should cover her eyes and forehead more, and fan out horizontally more. Her face, when compared to other drawings I've done, is less complicated in terms of the individual parts that make it up, and so there wasn't much I could do to fix it once it was made. With approximately 6 parts and layers affected by each change, it just wasn't practical, so I had to get creative. Instead of manipulating everything, I'd had to employ some tricks that simply implied the image I was trying to make. 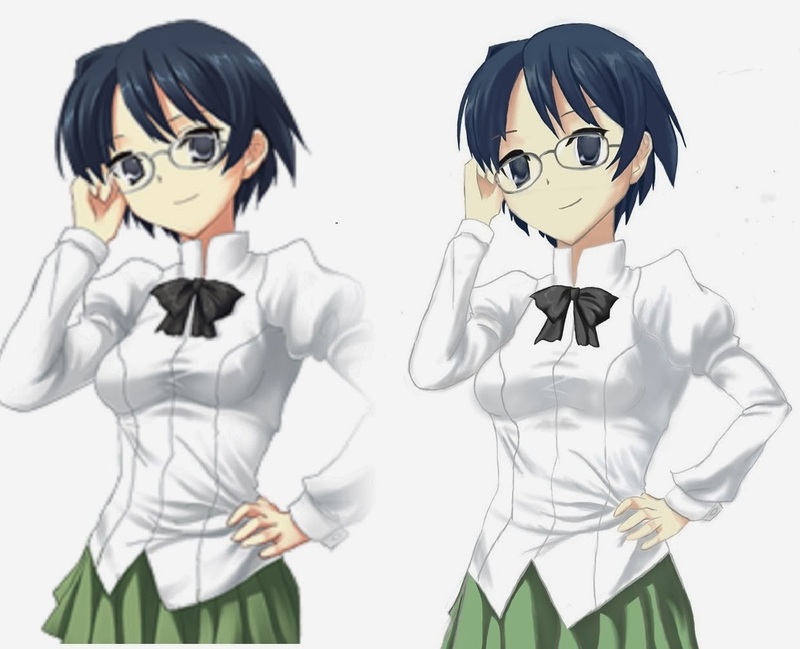 Her mouth, for instance, is in a slightly different position than the original, To imply a more cocked head, because I hadn't shaped it that way. As its own image, I think it looks okay, but as a recreation of the original, it's a little sloppy. The eyes on this one were particularly problematic. I know I've made a habit of commenting on that, but because of the simplicity of the face, and the mistakes I'd already made on the hair, any small deviation from the original image was particularly distracting. The glasses were also a sonofabitch. I redrew them so many times. To keep as close to the original image as possible, I had to make some awkward choices. For instance, you can see her right eye is stretched vertically a little bit. Getting them right was a huge battle, especially considering that in my pencil drawing of this same reference image, I made them in a single try. 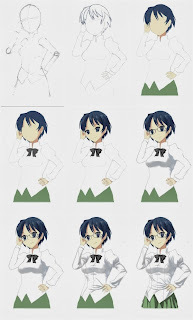 I was able to use the airbrush tool with a bit more confidence, working out the skin shadows, shirt ruffles, skirt ruffles and most other things with little issue. I'd used the pencil tool and airbrush almost exclusively, with chisel marker used for some fill-in. Overall not a bad project, and definitely representative of the progress I've made since I first tried drawing digitally. I think I can finally move on from this reference image and do something new now.